A 79-year-old white male presented with a three day history of intermittent chest pain and dyspnea. He had a prior history of anterior myocardial infarction and bypass surgery ten years previously. Treadmill stress was performed as part of the imaging study. The patient exercised to 90% of maximum predicted heart rate and achieved 10 METS. There were no significant stress-induced ECG changes. 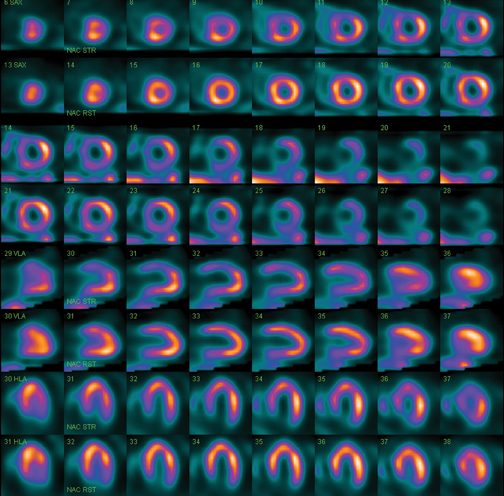 Rest and stress myocardial perfusion images were acquired at the appropriate time intervals after intravenous radiopharmaceutical administration (10 mCi at rest and 30 mCi at peak stress). Using concurrent imaging, an exclusive technology that enables the acquisition of up to 15 datasets into one acquisition step, gives physicians information more quickly and increases diagnostic confidence. Acquiring multiple isotopes simultaneously has the potential to improve timing resolution, providing increased efficiency and productivity as well as better patient comfort. Emission tomographic SPECT images were acquired both in 64×64 and 128×128 matrices. Figure 1 is 64×64 data with filtered backprojection reconstruction. Figure 2 is half the 128×128 data reconstructed with iterative reconstruction and low-dose CT attenuation correction (Philips Astonish). The 128×128 series more accurately depicted the extent and severity of ischemia as well as the presence of previous anterior infarction (not seen in 64×64). Coronary angiography subsequently found stenosis of the previous LAD graft and a stent was deployed with good restoration of blood flow. Corresponding ECG-gated images showed anterior hypokinesis with LVEF 42%. 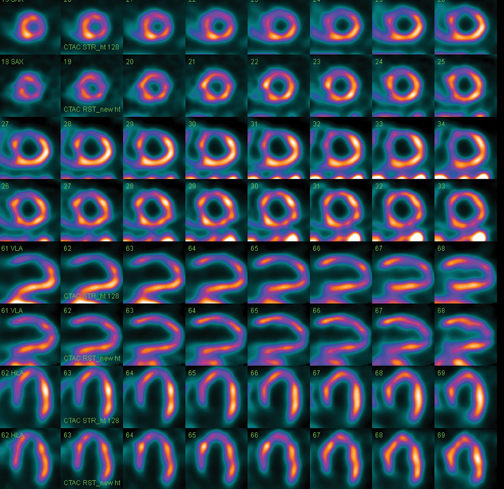 The study above demonstrates the improved accuracy of 128×128 myocardial perfusion SPECT-CT utilizing half the usual data. This can allow most clinics to decrease the administered doses of radiopharmaceutical by at least fifty percent, significantly lowering the patient radiation burden even with the addition of the small exposure from the low dose CT used for attenuation correction.2 Current reconstruction methodology and attenuation correction compensates for the lower count acquisitions. Alternatively, there is the option for longer acquisition times for higher counts, especially in large patients. Pazhenkottil AP, Ghadri J-R, Nikoulou RN, et al. Improved outcome prediction by SPECT myocardial perfusion imaging after CT attenuation correction. J Nucl Med. 2011; 52:196-200. Henzlova MJ and Duvall WL. The future of SPECT MPI: time and dose reduction. J Nucl Card. 2011; 18:580-587. Chang SM, Nabi F, Xu J, et al. Normal stress-only versus standard stress/rest myocardial perfusion imaging: similar patient mortality with reduced radiation exposure. J Am Coll Cardiol. 2010; 55:221-230. Myocardial Ischemia: SPECT-CT Low Dose Validation. Appl Radiol.